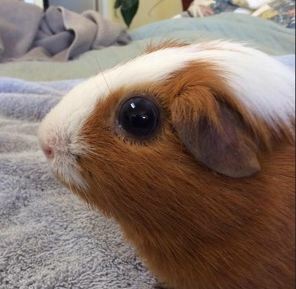 Wayne is a 3 1/2 year old guinea pig who was returned to our rescue after living in his home for over 3 years. He was born at our rescue so I'm sure of his age. Both of Wayne's eye were very large and he was somewhat bony, even though he weighs over 1300 grams (he's not a cuy, at least his mom wasn't). I took Wayne to the vet yesterday and found out that he has glaucoma in both eyes. It's bad enough that the lens of his eyes has fallen off and are sitting at the bottom of the eyeball. It was very strange - with a special instrument, you could see the lens sitting at the bottom of the eye. Anyway, our vet has recommended double enucleation, because the pressure in the eye can be quite painful. With the lens having already fallen off, he can't see well anyway, if at all. We're guessing that the pain may have caused him not to eat well, causing his bony condition. So, I'm concerned about the quality of life for a piggy with no eyes. We've recently paired Wayne with Maxwell, a very gentle 5 1/2 pound cuy male who seems to know something isn't right with Wayne. Maxwell hangs out right next to Wayne and is so sweet to him. Do piggies get around fairly well when blind, when they've been able to see most of their lives? I'm trying to figure out now how to set up his cage to make things the easiest for him when he loses his eyes. I'm wondering about removing huts etc and using fleece forests to hide in? DO blind guinea pigs do better with a water bowl instead of a water bottle? What about hay - should it just go on the floor instead of a rack? If anyone has any advice about getting the procedure done or how to set up a cage to make things easiest, I'd love to hear them. When the owner returned Wayne to me, she assured me that Wayne was healthy and hadn't had any problems his whole life. Sigh. From what I understand, they usually do quite well. There are different theories on whether to put food and things in familiar places or have them look more for food. I hear some companion pigs become "seeing eye" pigs for one who is not doing well. So just for getting around, I would not worry too much. Jacqueline will have some advice for you. I take it there is nothing that can otherwise be done for the glaucoma? Pigs rely more on scent than sight anyway, right? My vet is usually pretty conservative when it comes to surgeries. He was pretty quick to say this time that surgery is what is needed. The pressure in the eye is pretty uncomfortable. I've heard piggie's eyesight isn't real good anyway. I know some of our piggies can smell home-grown veggies entering the room long before they can see them. And these veggies aren't in plastic bags that are making noise. But still - a little eyesight is better than none. But I think it is affecting the rest of his health because he's somewhat thin. I've have two piggies who were either completely blind or pretty much blind and they both did okay. I also has one that had an eye removed and he did okay. I tried to leave things in the places they usually were, and tried not to have anything they could hurt themselves on if they bumped into them, but their hideys and stuff got moved around, either by themselves or their cage mates, and they managed to find them okay. Like LS said they rely more on scent. There were times I was certain they were looking at me, but it was just them raising their noses and sniffing for food. As I understand it, they rely much more on hearing and scent than on eyesight. From everything I've read and heard, he'll be fine. He'll actually feel much better; I strongly suspect he's eating less because of the pain. Do you have any pain med you can give him until his surgery? The advice I have always heard is to leave things in the same place. Leave water bottles, hides, food dishes, hay piles in the same places, and put them back in the same places after a cage clean. No ramps. If Maxwell gets along well with him, Maxwell will be an enormous help. That's the best thing Wayne has going for him, is a good buddy. Try an experiment for yourself. Tie something around your eyes, something fairly thick that blocks out light. Then, just listen. It'll take a little while, but you'll be surprised at how much you can tell about your surroundings (especially since you know what the room looks like) from hearing and smell. And we can't hear or smell anywhere near as well as guinea pigs can. The photo is of Wayne's eye before the surgery. The size of his eyes is what caused me to take him to the vet. Wayne had surgery to remove both eyes yesterday. He seems to be recovering well. When I put him back into his cage yesterday, he walked right over to his buddy, Maxwell, and laid near him. I gave them both veggies and Wayne started eating right away. Today he seems to be getting around ok. He's still eating well. It's so good to see him doing ok as I was real worried about this surgery. I don't usually stress about whether or not to do a surgery if my vet recommends it but then one I was stressing about. I had another piggy get an eye removed yesterday too - but this one was due to an abscess behind the eye. So it was a tough day. I certainly understand your concern with the eyes. They must have been very painful. I think you've given permission to add your photos so I will add this one too. I hope recovery goes well for both of them. Yes - you have permission. Aw, that's so nice that Wayne has a buddy to help him through recovery. Hope he feels better soon. Wayne was using the water bottle last night so that was great to see. I put A bowl of water in just in case he couldn't find the water bottle bottle spout but it looks like I didn't need to worry. They seem to do pretty well, especially when they have a seeing-eye buddy. Best to him, and to your other pigs too. That eye pic is frightening. Lynx, can that be put in the Records forum somewhere? That's valuable information, because while I have a rough idea of what glaucoma is, that photo graphically shows what it can look like. The eye page links to the Records thread. Excellent, thank you! Looks great. Also that is very cool that the ABVO page links to our eye page! I had a completely blind pig, who did very well, I just always set up the cage in the same way. Ditto on the seeing buddy - Lew had Mouse as a seeing eye pig, and they were very bonded. His eyes were kind of creepy. I didn't know that glaucoma caused an increase in the size of the eye. I took him to the vet because of the big eyes. I felt a bit silly but my instincts were right. Wayne was also thin so I thought there must be something bothering him. I just saw the link to the eye cage. That's pretty cool. I couldn't find much information on glaucoma which is one reason I'm trying to post about Wayne's progress. People always want to know how well enucleation goes too. I know it is often/usually successful but two members were unable to clear an infection postop. What causes the eyes to become enlarged like that? It's an excellent photo. And very good news that the surgery was successful! Glaucoma. Abnormally high pressure in the fluid inside the eye makes it bulge and enlarge like that.